Get Vendio Gallery - Now FREE! Antique French Sterling Silver 48pc Dinner Flatware Set, Elegant Louis XVI Style. 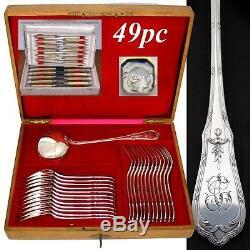 Antique French Sterling Silver 49pc Dinner Flatware Service, 12 Persons for Main Course, Plus Soup Ladle, in Oak Chest. Elegant antique French Belle Epoque era sterling silver 49pc dinner sized flatware set, a 4pc place setting for twelve with matching 13 soup ladle, two storage chests/boxes and classical French pattern! The sterling flatware and ladle are in their own original oak storage chest, all pieces with the French Minerve or Minerva hallmark. The tiny number "1" within those marks means they're in. 950 silver 95% pure and higher than the. 925 standard for "sterling" silver. The knives, as you can read below, were most often not included due to the'significance' of giving knives as a gift (cutting of the friendship). As with these, they are not original to the set but the pattern on the sterling handle caps and collars is so similar it's as if they're made for them. Sterling & horn handles and rare to find stainless steel blades so they're as pristine and usable as could be for an antique to vintage French set of knives. The pattern on both the knives and flatware consists of crossed ribbons & foliage in the Louis XVI style. A bit about French sterling flatware and the Heritage (with capital H) and Traditions (with capital T) that help define it as the best in the world: A traditional wedding gift, these magnificent French sterling silver flatware sets were almost always packaged without knives. Another French tradition has to do with the gift of knives or a knife as a symbol of the cutting or ending of a relationship. And no where on earth is tradition more important, perhaps, than to the French culture. So, in light of the symbolism of the gift, knives were not part of a wedding gift, not packaged or even usually made with the matching pattern of the forks, spoons in a set, and are something added later and as compliments to the table's sterling silver choice. And ever the center influence in fashion, this also opportuned the happy result of knives made in coordinating and complimenting fashion with handles of rich elegant mother of pearl, fine ivory, blond natural horn, or exotic hardwoods like ebony (a French Empire'must') walnut, rosewood. The result is that you can add sets of knives to compliment and define your table setting. More about knives: Louis XIV, A renaissance man if ever there were one, The Sun King - builder of Versailles, was also the man responsible for the design of the modern table knife. Prior to his time, knives used at table were similar to knives used to kill game, fight wars, and possibly kill Kings. There was a time when knives were even banned from table for such intrigues, and it was Louis XIV's table upon which the blunt and rounded tip knives for dining were introduced to the world at large. A side note: With the massive size of the dinner fork and spoon in French sterling, one need not look to the knife as a weapon - as one of my customers once suggested, and I paraphrase here here: These things are heavy enough to kill a guest if thrown. She is correct - they weigh in nearly double the large tablespoon of, say, the equivalent set made in America by Gorham or Whiting - "Lily", which tablespoon is more closely in line size and weight-wise with the entremet spoon in French flatware. All have just been polished and have a fine luster. Some slight surface scuffing in places and some faint knife marks possible to some fork tines but no bends, breaks, damage or repairs. The knives are all in great shape, no breaks or splits in the horn handles and only very faint surface scuffing to the blades. The oak chest is in fine shape, working lock & key but it does look like someone had tried to pry in open at some point judging from the'dents' to the edge of the oak around the lock area. See pictures for all weights and measurements. We're easy to deal with. Our fine inventory is very important. We have a HUGE assortment of the finest antiques to be found online, all at your fingertips with Antiques & Uncommon Treasure. _gsrx_vers_631 GS 6.9.8b6 (631). The item "Antique French Sterling Silver 48pc Dinner Flatware Set, Elegant Louis XVI Style" is in sale since Sunday, November 20, 2016. This item is in the category "Antiques\Silver\Sterling Silver (.